What conditions does Serophene treat? Stomach upset, bloating, abdominal/pelvic fullness, flushing ("hot flashes"), breast tenderness, headache, or dizziness may occur. If any of these effects last or get worse, tell your doctor or pharmacist promptly. Tell your doctor right away if you have any serious side effects, including: abnormal vaginal bleeding, mental/mood changes. List Serophene side effects by likelihood and severity. Before taking clomiphene, tell your doctor or pharmacist if you are allergic to it; or if you have any other allergies. This product may contain inactive ingredients, which can cause allergic reactions or other problems. Talk to your pharmacist for more details. Before using this medication, tell your doctor or pharmacist your medical history, especially of: ovarian cysts or enlarged ovaries (not due to polycystic ovary syndrome), abnormal vaginal bleeding, liver disease, uterus problems (e.g., uterine fibroids, endometriosis), thyroid/adrenal gland problems, tumor in the brain (pituitary tumor), high levels of fats/triglycerides in the blood. Use of clomiphene may result in multiple births (e.g., twins, triplets). Consult your doctor for more details. It is not known whether this drug passes into breast milk. This drug may reduce milk production. Consult your doctor before breast-feeding. What should I know regarding pregnancy, nursing and administering Serophene to children or the elderly? If someone has overdosed and has serious symptoms such as passing out or trouble breathing, call 911. Otherwise, call a poison control center right away. US residents can call their local poison control center at 1-800-222-1222. Canada residents can call a provincial poison control center. Symptoms of overdose may include: vomiting, abdominal/pelvic pain, vision problems. Laboratory and/or medical tests (e.g., hormone levels, pelvic examination/ultrasound) should be performed regularly to monitor your progress or check for side effects. Consult your doctor for more details. If you miss a dose, contact your doctor promptly for further instructions. Do not double the dose to catch up unless your doctor directs you to do so. 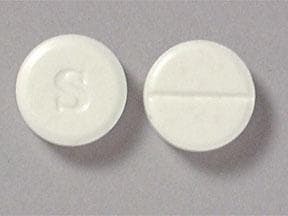 This medicine is a white, round, scored, tablet imprinted with "S". Are you considering switching to Serophene? How long have you been taking Serophene?